Jacopo Carucci (May 24, 1494 – January 2, 1557), usually known as Jacopo da Pontormo, Jacopo Pontormo or simply Pontormo, was an Italian Mannerist painter and portraitist from the Florentine School. His work represents a profound stylistic shift from the calm perspectival regularity that characterized the art of the Florentine Renaissance. He is famous for his use of twining poses, coupled with ambiguous perspective; his figures often seem to float in an uncertain environment, unhampered by the forces of gravity. Jacopo had not been many months in Florence before Bernardo Vettori sent him to stay with Leonardo da Vinci, and then with Mariotto Albertinelli, Piero di Cosimo, and finally, in 1512, with Andrea del Sarto, with whom he did not remain long, for after he had done the cartoons for the arch of the Servites, it does not seem that Andrea bore him any good will, whatever the cause may have been. Pontormo painted in and around Florence, often supported by Medici patronage. A foray to Rome, largely to see Michelangelo's work, influenced his later style. Haunted faces and elongated bodies are characteristic of his work. 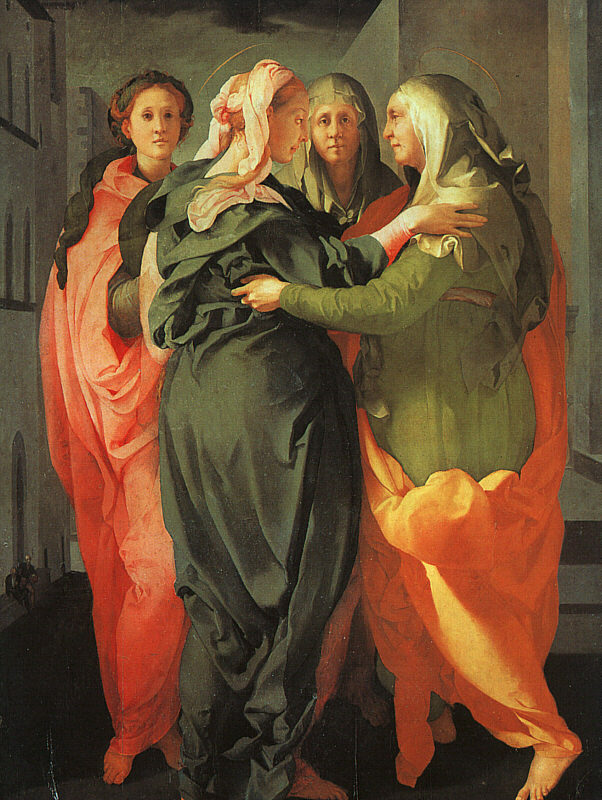 An example of Pontormo's early style is a fresco depicting the Visitation of the Virgin and St Elizabeth, with its dancelike, balanced figures, painted from 1514 to 1516. This early Visitation makes an interesting comparison with his painting of the same subject which was done about a decade later, now housed in the parish church of St. Michael Archangel in Carmignano, about 20 km west of Florence. Placing these two pictures together—one from his early style, and another from his mature period—throws Pontormo's artistic development into sharp relief. In the earlier work, Pontormo is much closer in style to his teacher, Andrea del Sarto, and to the early sixteenth century renaissance artistic principles. For example, the figures stand at just under half the height of the overall picture, and though a bit more crowded than true high renaissance balance would prefer, at least are placed in a classicizing architectural setting at a comfortable distance from the viewer. In the later work, the viewer is brought almost uncomfortably close to the Virgin and St. Elizabeth, who drift toward each other in clouds of drapery. Moreover, the clear architectural setting that is carefully constructed in earlier piece has been completely abandoned in favor of a peculiar nondescript urban setting. The Joseph canvases (now in the National Gallery in London) offer another example of Pontormo's developing style. Done around the same time as the earlier Visitation, these works (such as Joseph in Egypt, at left) show a much more mannerist leaning. According to Giorgio Vasari, the sitter for the boy seated on a step is his young apprentice, Bronzino. In the years between the SS Annunziata and San Michele Visitations, Pontormo took part in the fresco decoration of the salon of the Medici country villa at Poggio a Caiano (1519–20), 17 km NNW of Florence. There he painted frescoes in a pastoral genre style, very uncommon for Florentine painters; their subject was the obscure classical myth of Vertumnus and Pomona in a lunette. 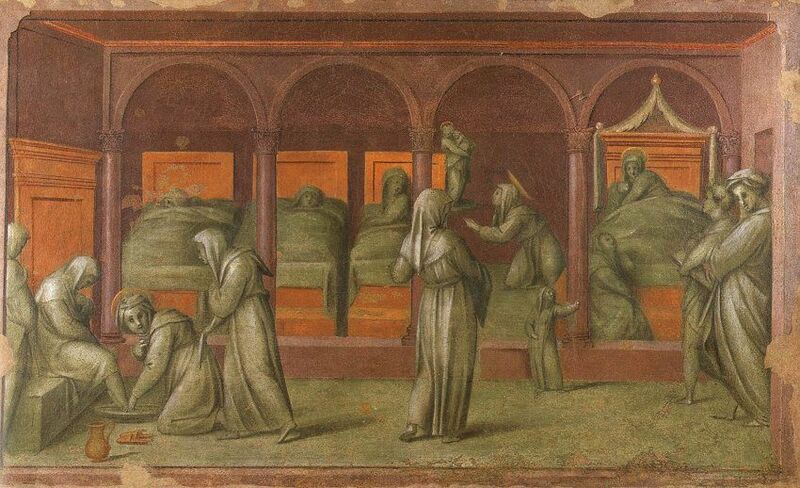 In 1522, when the plague broke out in Florence, Pontormo left for the Certosa di Galluzzo, a cloistered Carthusian monastery where the monks followed vows of silence. He painted a series of frescoes, now quite damaged, on the passion and resurrection of Christ. The large altarpiece canvas for the Brunelleschi-designed Capponi Chapel in the church of Santa Felicita, Florence, portraying The Deposition from the Cross (1528), is considered by many Pontormo's surviving masterpiece. The figures, with their sharply modeled forms and brilliant colors are united in an enormously complex, swirling ovular composition, housed by a shallow, somewhat flattened space. Although commonly known as The Deposition from the Cross, there is no actual cross in the picture. The scene might more properly be called a Lamentation or Bearing the Body of Christ. Those who are lowering (or supporting) Christ appear as anguished as the mourners. Though they are bearing the weight of a full-grown man, they barely seem to be touching the ground; the lower figure in particular balances delicately and implausibly on his front two toes. These two boys have sometimes been interpreted as angels, carrying Christ in his journey to Heaven. In this case, the subject of the picture would be more akin to an Entombment, though the lack of any discernible tomb disrupts that theory, just as the lack of cross poses a problem for the Deposition interpretation. Finally, it has also been noted that the positions of Christ and the Virgin seem to echo those of Michelangelo's Pietà in Rome, though here in the Deposition mother and son have been separated. Thus in addition to elements of a Lamentation and Entombment, this picture carries hints of a Pietà. It has been speculated that the bearded figure in the background at the far right is a self-portrait of Pontormo as Joseph of Arimathea. Another unique feature of this particular Deposition is the empty space occupying the central pictorial plane as all the Biblical personages seem to fall back from this point. It has been suggested that this emptiness may be a physical representation of the Virgin Mary's emotional emptiness at the prospect of losing her son. On the wall to the right of the Deposition, Pontormo frescoed an Annunciation scene (at left). As with the Deposition, the artist's primary attention is on the figures themselves rather than their setting. Placed against white walls, the Angel Gabriel and Virgin Mary are presented in an environment that is so simplified as to almost seem stark. The fictive architectural details above each of them, are painted to resemble the gray stone pietra serena that adorns the interior of Santa Felicità, thus uniting their painted space with the viewer's actual space. The startling contrast between the figures and ground makes their brilliant garments almost seem to glow in the light of the window between them, against the stripped-down background, as if the couple miraculously appeared in an extension of the chapel wall. The Annunciation resembles his above mentioned Visitation in the church of San Michele at Carmignano in both the style and swaying postures. Vasari tells us that the cupola was originally painted with God the Father and Four Patriarchs. The decoration in the dome of the chapel is now lost, but four roundels with the Evangelists still adorn the pendentives, worked on by both Pontormo and his chief pupil Agnolo Bronzino. The two artists collaborated so closely that specialists dispute which roundels each of them painted. This tumultuous oval of figures took three years for Pontormo to complete. According to Vasari, because Pontormo desired above all to "do things his own way without being bothered by anyone," the artist screened off the chapel so as to prevent interfering opinions. Vasari continues, "And so, having painted it in his own way without any of his friends being able to point anything out to him, it was finally uncovered and seen with astonishment by all of Florence..."
A number of Pontormo's other works have also remained in Florence; the Uffizi Gallery holds his mystical Supper at Emmaus as well as portraits. Many of Pontormo's well known canvases, such as the early Joseph in Egypt series (c. 1515) and the later Martyrdom of St Maurice and the Theban Legion (c. 1531) depict crowds milling about in extreme contrapposto of greatly varied positions. 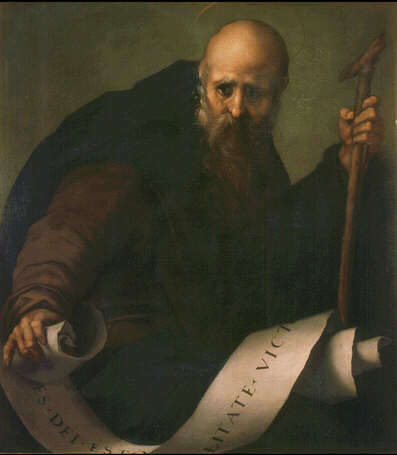 His portraits, acutely characterized, show similarly Mannerist proportions. Many of Pontormo's works have been damaged, including the lunnettes for the cloister in the Carthusian monastery of Galluzo. They now are displayed indoors, although in their damaged state. Perhaps most tragic is the loss of the unfinished frescoes for the Basilica of San Lorenzo, Florence which consumed the last decade of his life. His frescoes depicted a Last Judgment day composed of an unsettling morass of writhing figures. The remaining drawings, showing a bizarre and mystical ribboning of bodies, had an almost hallucinatory effect. Florentine figure painting had mainly stressed linear and sculptural figures. For example, the Christ in Michelangelo's Last Judgment in the Sistine Chapel is a massive painted block, stern in his wrath; by contrast, Pontormo's Jesus in the Last Judgment twists sinuously, as if rippling through the heavens in the dance of ultimate finality. Angels swirl about him in even more serpentine poses. If Pontormo's work from the 1520s seemed to float in a world little touched by gravitational force, the Last Judgment figures seem to have escaped it altogether and flail through a rarefied air. Vasari's Life of Pontormo depicts him as withdrawn and steeped in neurosis while at the center of the artists and patrons of his lifetime. This image of Pontormo has tended to color the popular conception of the artist, as seen in the film of Giovanni Fago, Pontormo, a heretical love. Fago portrays Pontormo as mired in a lonely and ultimately paranoid dedication to his final Last Judgment project, which he often kept shielded from onlookers. Yet as the art historian Elizabeth Pilliod has pointed out, Vasari was in fierce competition with the Pontormo/Bronzino workshop at the time when he was writing his Lives of the Most Excellent Painters, Sculptors, and Architects. This professional rivalry between the two bottegas could well have provided Vasari with ample motivation for running down the artistic lineage of his opponent for Medici patronage. Perhaps as a result of Vasari's derision, or perhaps because of the vagaries of aesthetic taste, Pontormo's work was quite out of fashion for several centuries. The fact that so much of his work has been lost or severely damaged is testament to this neglect, though he has received renewed attention by contemporary art historians. Indeed, between 1989 and 2002, Pontormo's Portrait of a Halberdier (at right), held the title of the world's most expensive painting by an Old Master. Regardless as to the veracity of Vasari's account, it is certainly true that Pontormo's artistic idiosyncrasies produced a style that few were able (or willing) to imitate, with the exception of his closest pupil Bronzino. Bronzino's early work is so close to that of his teacher, that the authorship of several paintings from the 1520s and '30s is still under dispute—for example, the four tondi containing the Evangelists in the Capponi Chapel, and the Portrait of a Lady in Red now in Frankfurt. Pontormo shares some of the mannerism of Rosso Fiorentino and of Parmigianino. In some ways he anticipated the Baroque as well as the tensions of El Greco. His eccentricities also resulted in an original sense of composition. At best, his compositions are cohesive. The figures in the Deposition, for example, appear to sustain each other: removal of any one of them would cause the edifice to collapse. In other works, as in the Joseph canvases, the crowding makes for a confusing pictorial melee. It is in the later drawings that we see a graceful fusion of bodies in a composition which includes the oval frame of Jesus in the Last Judgement. Matthew, Luke, & John (Mark painted by Bronzino) 1525–1526 Santa Felicita, Capponi Chapel, Florence. ^ "Pontormo: Miraculous Encounters". The Morgan Library & Museum. 4 April 2018. Retrieved 9 November 2018. ^ One attempt at defining mannerist art is to characterize it as art that follows art rather than art that follows nature, or life. [See for example Sydney Freedberg's notion of the 'quoted' form in "Observations on the Painting of the Maniera" Art Bulletin 47 (1965), pp. 187–97.] Though Freedberg did not classify Pontormo as a strictly maniera painter, if we accept that the Deposition does hold a quotation from Michelangelo's Pietà, then perhaps we can understand better how Pontormo fits in as a mannerist and into his own larger history of sixteenth century art. ^ See "An Introduction to Vasari's Story" in Pontormo, Bronzino, and Allori: A Genealogy of Florentine Art (New Haven, CT: Yale University Press, 2001). ^ "Portrait of Maria Salviati de' Medici with Giulia de' Medici". Walters Art Museum. The Annunciation is a wall painting by the Italian mannerist artist Jacopo Pontormo, executed in 1527–1528 as part of his commission to decorate the Capponi Chapel in the church of Santa Felicita, Florence. It is frescoed around the window on the wall adjacent to Pontormo's masterpiece, the famous Deposition from the Cross. Pontormo depicts the Annunciation, the revelation to Mary by the Archangel Gabriel that she would conceive a child to be born the Son of God, in a lively composition, with both figures in an elastic contrapposto. Agnolo di Cosimo (Italian: [ˈaɲɲolo di ˈkɔːzimo]; November 17, 1503 – November 23, 1572), usually known as Bronzino ("Il Bronzino" [il bronˈdziːno] in Italian), or Agnolo Bronzino, was an Italian Mannerist painter, born in Florence. His sobriquet, Bronzino, may refer to his relatively dark skin or reddish hair.He lived all his life in Florence, and from his late 30s was kept busy as the court painter of Cosimo I de' Medici, Grand Duke of Tuscany. He was mainly a portraitist but also painted many religious subjects, and a few allegorical subjects, which include what is probably his best known work, Venus, Cupid, Folly and Time, c. 1544–45, now in London. Many portraits of the Medicis exist in several versions with varying degrees of participation by Bronzino himself, as Cosimo was a pioneer of the copied portrait sent as a diplomatic gift. The Barbadori Chapel, later Capponi Chapel, is a chapel in the church of Santa Felicita in Florence, central Italy. It was designed by Filippo Brunelleschi, and was later decorated by a cycle of works by the Mannerist painter Pontormo. The Carmignano Visitation is a c.1528-1530 oil on panel painting of the Visitation by Pontormo, now in the propositura dei Santi Michele e Francesco in Carmignano (PO, Italy). Unmentioned in Vasari's Lives of the Artists, the painting is usually attributed to the years just after Pontormo's work on the Capponi Chapel. Originally on the Pinadori family altar, it has remained in the church for which it was painted for almost its whole existence. A preparatory drawing for it is now in the Uffizi, with the squaring for its transfer to the panel. Its rhombus composition is based on that of Four Witches, a 1497 print by Dürer. It inspired Bill Viola's video work The Greeting (1995), which for a time was exhibited in a room next to the painting. The painting has appeared in the temporary exhibitions Pontormo e Rosso Fiorentino. Divergenti vie della maniera (Palazzo Strozzi, Florence, 2014) and Bill Viola. Rinascimento elettronico (Palazzo Strozzi, Florence, 2017). Florence Charterhouse (Certosa di Firenze or Certosa del Galluzzo) is a charterhouse, or Carthusian monastery, located in the Florence suburb of Galluzzo, in central Italy. The building is a walled complex located on Monte Acuto, at the point of confluence of the Ema and Greve rivers. The charterhouse was founded in 1341 by the Florentine noble Niccolò Acciaioli, Grand Seneschal of the Kingdom of Naples, but continued to expand over the centuries as the recipient of numerous donations. In 1958 the monastery was taken over by Cistercian monks. The chapter house now holds lunettes from the cloister, frescoed by Pontormo, damaged by exposure to the elements. The charterhouse inspired Le Corbusier for his urban projects.The monastery houses the Società Internazionale per lo Studio del Medioevo Latino, an Italian non-profit cultural institute. Giulia Romola di Alessandro de' Medici (c. 1535 – c. 1588) was the illegitimate, possibly biracial, daughter of Alessandro de' Medici, Duke of Florence and his mistress Taddea Malaspina. Following her father's assassination, she was reared at the court of Cosimo I de' Medici and married advantageously twice. The Madonna with Child and Saints, also known as Pala Pucci, is a painting by the Italian late Renaissance painter Jacopo Pontormo, executed in 1516. It is housed in the church of San Michele Visdomini in Florence. It portrays numerous figures. Saint Joseph, on the left, is holding Jesus (a role usually fulfilled by the Madonna). The presence of Saint Joseph is explained by the fact that the Gospel of James deals with Christ's childhood and praises Joseph's paternal cares. Saint Francis is connected to name of the committant and the devotion of his order towards Jesus. Mannerism, also known as Late Renaissance, is a style in European art that emerged in the later years of the Italian High Renaissance around 1520, spreading by about 1530 and lasting until about the end of the 16th century in Italy, when the Baroque style largely replaced it. Northern Mannerism continued into the early 17th century.Stylistically, Mannerism encompasses a variety of approaches influenced by, and reacting to, the harmonious ideals associated with artists such as Leonardo da Vinci, Raphael, and early Michelangelo. Where High Renaissance art emphasizes proportion, balance, and ideal beauty, Mannerism exaggerates such qualities, often resulting in compositions that are asymmetrical or unnaturally elegant. The style is notable for its intellectual sophistication as well as its artificial (as opposed to naturalistic) qualities. It favors compositional tension and instability rather than the balance and clarity of earlier Renaissance painting. Mannerism in literature and music is notable for its highly florid style and intellectual sophistication.The definition of Mannerism and the phases within it continue to be a subject of debate among art historians. For example, some scholars have applied the label to certain early modern forms of literature (especially poetry) and music of the 16th and 17th centuries. The term is also used to refer to some late Gothic painters working in northern Europe from about 1500 to 1530, especially the Antwerp Mannerists—a group unrelated to the Italian movement. Mannerism has also been applied by analogy to the Silver Age of Latin literature. Maria Salviati (17 July 1499 – 29 December 1543) was an Italian noblewoman, the daughter of Lucrezia di Lorenzo de' Medici and Jacopo Salviati. She married Giovanni dalle Bande Nere and was the mother of Cosimo I de Medici. Her husband died 30 November 1526, leaving her a widow at the age of 27. Salviati never remarried; after her husband's death she adopted the somber garb of a novice, which is how she is remembered today as numerous late portraits show her attired in black and white. Pedro Machuca (born Toledo, Spain ca. 1490; died 1550) is mainly remembered as the Spanish architect responsible for the design of the Palace of Charles V (begun 1528) adjacent to the Alcazar in Granada. The significance of this work is that it represents likely the first major classic Renaissance style building in Spain. Culturally, it represents the urge by the conquering Christians to challenge the hegemony of Moorish architecture in the recently (1492) acquired province of Granada. The details of his life are poorly known. 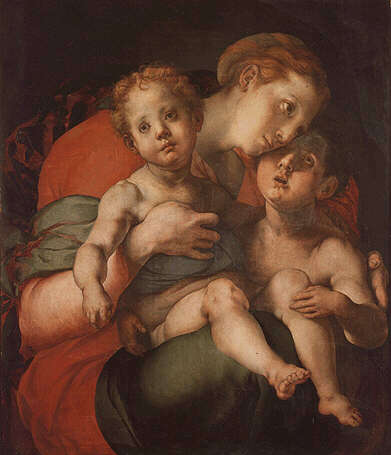 Born in Toledo, he is said to have been a pupil or friends with Michelangelo and Pontormo. Returning to Spain in 1520, he worked as a painter in the Royal Chapel of Granada, as well as in Jaén, Toledo, and Uclés. Pontormo – Un amore eretico is a 2004 film by Italian director Giovanni Fago. The Portrait of Bia de' Medici is an oil-tempera on wood painting by Agnolo Bronzino, dating to around 1542 and now in the Uffizi in Florence. For a long time it was displayed in the Tribuna at the heart of the museum, but since 2012 it has been moved to the 'sale rosse' of the Nuovi Uffizi. A second portrait, by Pontormo, has also been argued to show Bia de' Medici, but this identification is disputed. Sacrificial Scene is a grisaille tempera on canvas painting by Pontormo, produced around 1520 and now in the National Museum of Capodimonte in Naples. It was probably originally produced as part of the decoration of an interior in honour of Cosimo de' Medici. The canvas was later mounted on panel, probably to be part of a mobile apparatus. It first appeared in the Farnese collection inventories in 1644 and was moved to Naples with the rest of the collection late in the 18th century, where it was displayed in Room 10 of the Capodimonte Museum. The Basilica della Santissima Annunziata (Basilica of the Most Holy Annunciation) is a Renaissance-style, Roman Catholic minor basilica in Florence, region of Tuscany, Italy. This is considered the mother church of the Servite Order. It is located at the northeastern side of the Piazza Santissima Annunziata near the city center. 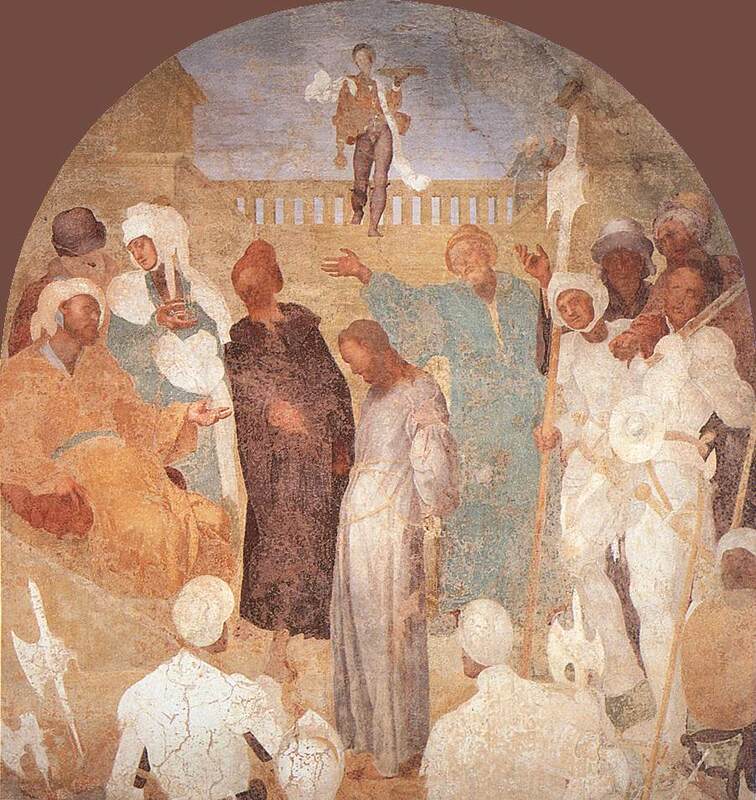 St. Quentin is a painting attributed to the Italian Renaissance master Jacopo Pontormo. According to Giorgio Vasari's Vite, one of Pontormo's pupils, Gianmaria Pichi, was commissioned by his hometown of Sansepolcro a processional standard with the figure of St. Quentin; Pontormo decided to collaborate on the work, at the extent that he finished to complete most of it. 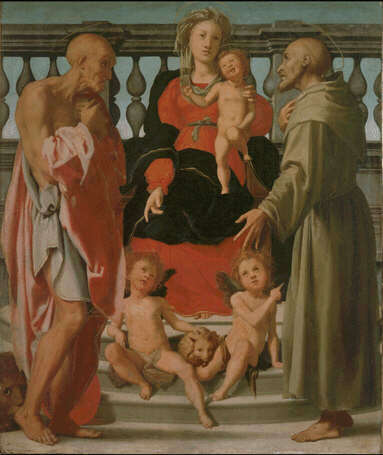 The saint's posture resembles that of the Dying Slave by Michelangelo: the fact that Pontormo was friend of the latter confirms the attribution. The position of the nails in St. Quentin's body is directly inspired to Jacopo da Varagine's Legenda Aurea. The Deposition from the Cross is an altarpiece, completed in 1528, depicting the Deposition of Christ by the Italian Renaissance painter Jacopo Pontormo. It is broadly considered to be the artist's surviving masterpiece. Painted in oil on wood, the painting is located above the altar of the Capponi Chapel of the church of Santa Felicita in Florence. The Entombment usually refers to the entombment, or burial, of Jesus. Valentina Fago (born 22 April 1971 in Bologna) is an Italian actress. Actress in theatre with Luca Ronconi, Stanislas Nordey, Thierry Salmon, Denis Marleau among many others. She acts also in cinema in Pontormo - un amore eretico (direction: Giovanni Fago) and in il ponte (direction: Stefano Missio). She lives in Paris where she teaches theatrical practice. The fresco decoration of Vertumnus and Pomona in the Medici country villa at Poggio a Caiano (near Montalbano) was painted by Jacopo Pontormo. The villa is set among orchards and gardens, and in summer, served as a retreat from the heat in Florence. The fresco surrounds a lunette, high in a barrel-vaulted central hall. The allegorical figures over the doors and the facing fresco depicting Julius Caesar, begun by Pontormo’s mentor, Andrea del Sarto, were completed decades later by Alessandro Allori. Pontormo initially received the commission from Ottaviano de' Medici and Cardinal Giulio de' Medici, the future Clement VII, and Giovanni de’ Medici (later pope as Leo X). The painting depicts peasants, including a naked youth, picking fruit or lounging beneath trees in a walled framework. Putti garland the window. The stated theme is the classical myth of Vertumnus and Pomona taken from a story in Ovid's Metamorphoses. The myth is that of Pomona, a beautiful but aloof wood-nymph, shown with a sickle at right lower corner, who sheltered herself inside her orchard, dedicating herself to its cultivation while spurning all suitors. Vertumnus, either a demigod of seasons or a satyr, becomes taken with the nymph's beauty, but she ignores and rebuffs all his advances to enter her realm and remains a maiden. The mutable Vertumnus gains access to the orchard disguised or transformed into an old woman (depicted as an old man with a basket, however, in this fresco). Once inside, the myth relates that the disguised Vertumnus convinces Pomona, by means of allusive stories, to "carpe diem" and choose the handsome youth Vertumnus, who finally reveals his true form. One interpretation of this fresco is that the allegory delicately counterposes the turns in the myth using a mirror fashion in each hemi-lunette by depicting a contrast of the elder-faced Vertumnus with the rapt Pomona, the youth with a basket and a turning maiden, and finally, the naked man aloft on the fence picking fruit from the same tree from which, at a distance, the maiden trims a branch while clothed in a red dress that suggests arousal. This is an elaborately seductive interpretation for this fresco that was created for a family closely associated with the papacy. The imagery is an apt choice for this rural farm, however. It lacks the usual melancholy of Pontormo's religious canvases, and thus, is unique among his works. In some ways, this painting is aberrant in the prevailing current of Florentine painting of its time. Florentine painting, if not portraiture, often was intellectual, academic, and focused on allegory, mythology, or religious themes. Genre topics and still life studies were rare for the high-minded Florentines. In addition, nearly all Italian painting until that time depicted indoor settings or included urban landscapes, and if not, the landscape was unmemorable sfumato dissipating in the distance. The summer season evoked by the fruit and the reposing figures in the fresco is powerful as well as soothing. The theme of the relaxed near-genre scene gently suggests fertility.